Before the rise of the 28mm and then the 24mm the 35mm was the most popular wide-angle model in a maker’s range, and is still a firm favorite today for street photography. Nikon’s completely redesigned full frame 11-element 35mm f1.8 replaces the lightweight and compact film-era 6-element AF Nikkor 35mm f2D version. Increasingly common now with modern lenses designs, even with modestly priced models like this is the adoption of low-dispersion glass. It has one ED glass element as well as one asphere to reduce fringing and distortion. Like all new models in Nikon’s line-up it’s built to the current G-series spec – meaning no aperture ring but the inclusion of a built-in, near silent sonic type AF motor with full-time manual focus override. With a minimum focus distance of 9.4-inches the adoption of a rear focus mechanism negates an extending barrel with user benefits including fast auto-focus and potentially a more durable design – limiting damage to the focus mechanism from inadvertent knocks or when using heavy filters. Despite the more complex optical construction and inclusion of an AF motor the new model remains relatively lightweight at 10.8oz (305g). It’s also not quite so compact as the original, measuring 2.81-in (71.5mm) from front to back and adopting a 58mm filter thread (up from 52mm of its predecessor). The new model is available now, complete with plastic hood and soft case and 1-year warranty, at $599.95. 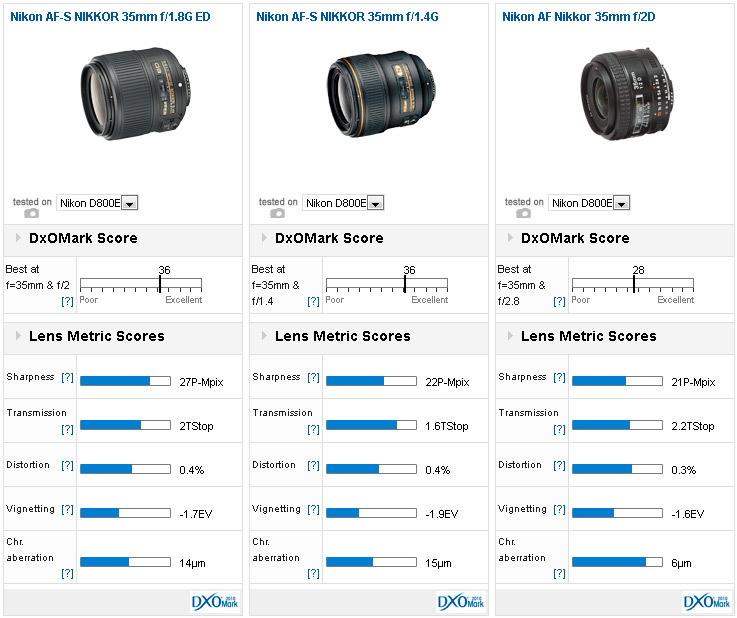 The new Nikkor achieves a DxOMark score of 27 points, indicating that this model is one of the best performing lenses of this focal length on the Nikon D800E. Peak sharpness is high at 27P-Mpix but this lens has high sharpness from the initial aperture with only slight softening towards the corners. Stopping down to f2.8 improves the uniformity of sharpness but the edges never really match the center till f11 where the effects of diffraction can been seen. Transmission, distortion and vignetting are all within accepted levels however, even with the low-dispersion glass, chromatic aberration is a little higher than expected – it’s noticeable as a ring surrounding the center. Compared to its predecessor the new model is optically superior to the older film-era lens in most areas. 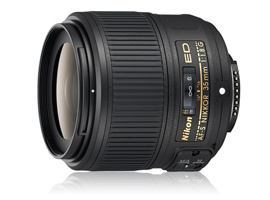 It fact it’s on a par with the firm’s highly regarded high-speed AF-S Nikkor 35mm f1.4G. 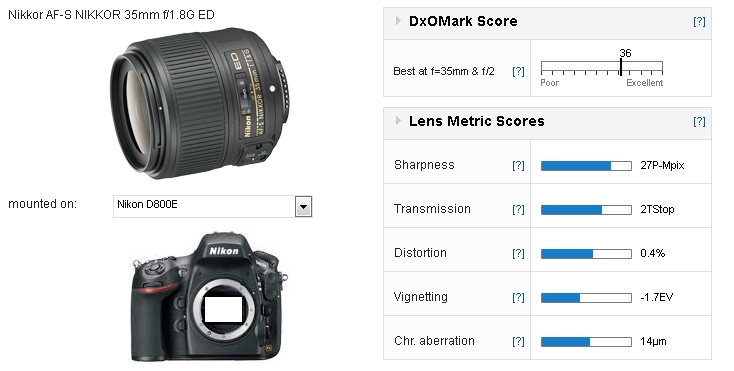 On the Nikon D800E the new 35mm f1.8 even surpasses that $1,800 model in peak sharpness. At full aperture the new lens out performs both models and is entirely usable at f1.8. At f2, the high-end 35mm f1.4 is a match for the f1.8 model, but that in turn is still way ahead of the f2 in peak sharpness and uniformity. By f5.6 the trio perform similarly, although the 35mm f1.8 has the advantage in uniformity. 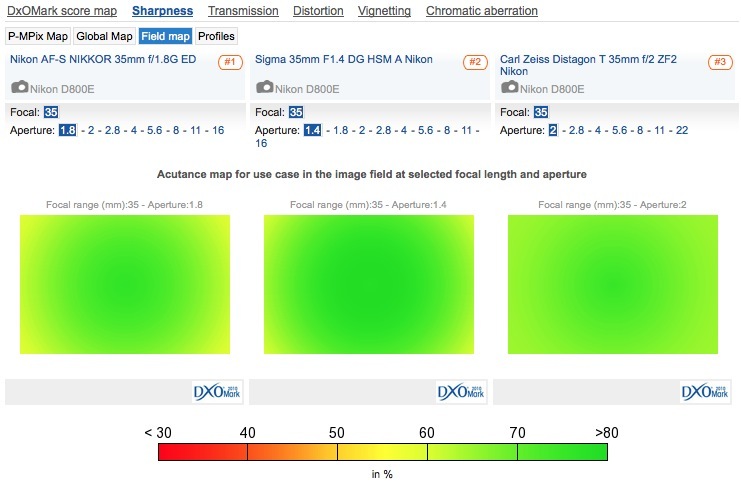 Although distortion and vignetting are more or less equal, surprisingly perhaps, the older AF-D version has some of the lowest levels of chromatic aberration of any model in this focal length. The new Nikkor has excellent sharpness even outperforms the firm’s premium 35mm f1.4 model at wider apertures. At a shade under $600, the new Nikkor model is two-thirds the price of the Art-series Sigma 35mm f1.4 and it comes close to that model’s peak sharpness, even if it can’t match the Sigma’s degree of correction. However, the Sigma is sharper at f1.4 than the Nikkor is at f1.8 and that same aperture it’s significantly sharper across 90% of the image field. The Sigma has quite heavy vignetting but this decreases quickly on stopping down, and of course it has befittingly low chromatic aberration. Zeiss make an f1.4 but this f2 is more akin to the Nikkor in maximum aperture and price (although it’s still not cheap exactly at $1005). 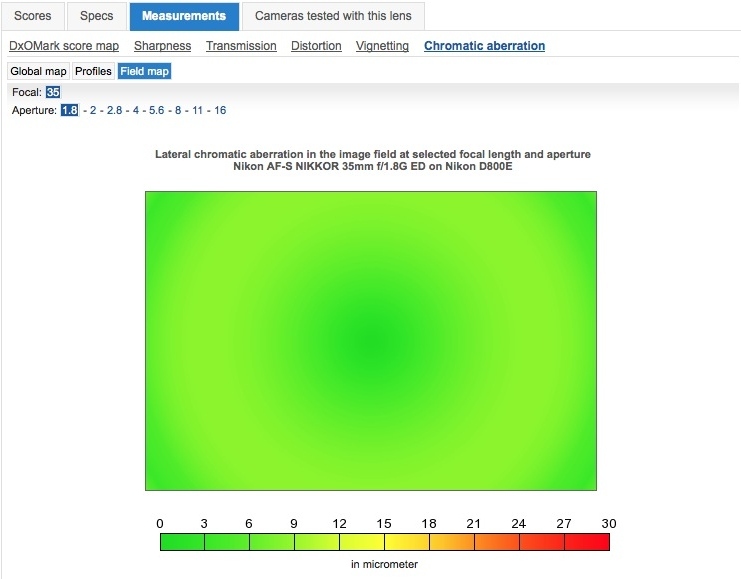 The Zeiss is, as you would expect a good performer, equal in many ways to the Nikkor although it has far better control of chromatic aberration – it’s relatively high when measured but limited to the extreme corners. 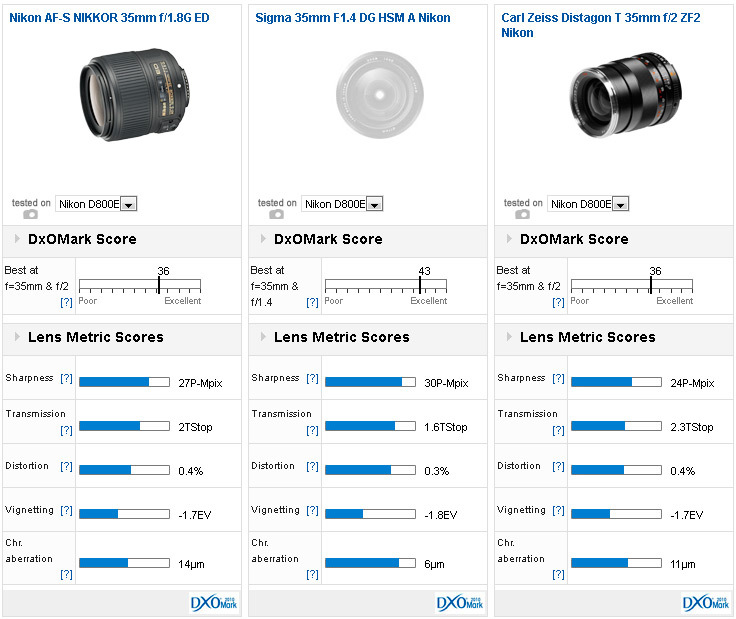 All three have excellent performance at full aperture, but the Nikkor still can’t match the over 0.5 Tstop faster Sigma. Nikon’s new modestly priced models, starting with the 50mm f1.8, then followed in quick succession by the 85mm, 28mm and now the new 35mm all perform to a remarkably high level. 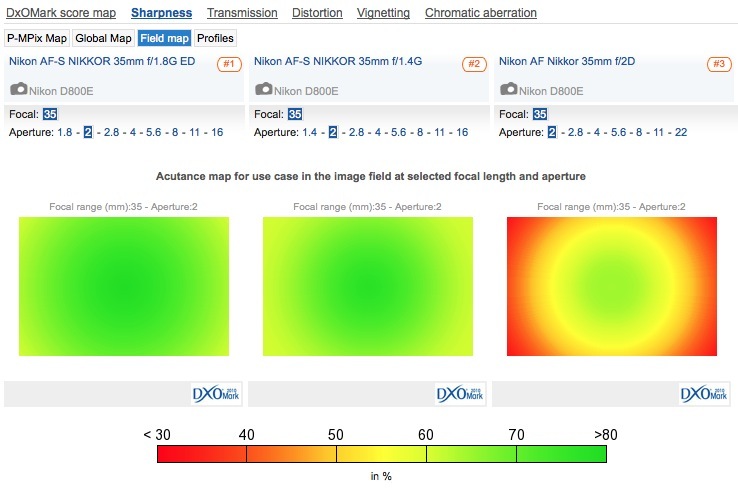 In fact the 50mm, 85mm and 35mm challenge the firm’s ultra high-speed models in optical quality. While they can’t match the mechanical standard of those models they certainly make a compelling alternative if weight and price are a consideration, and the new 35mm looks set to be a popular choice for street photography and reportage.